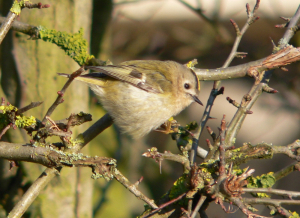 Observation - goldcrest in hawthorn bush - UK and Ireland. Description: High, 'tinselly' song first heard, then saw it flitting around hawthorn bush, like a little fluffy pin-ball, hunting for insects in twigs; it seemed quite unconcerned by my presence only ~2m away. High, 'tinselly' song first heard, then saw it flitting around hawthorn bush, like a little fluffy pin-ball, hunting for insects in twigs; it seemed quite unconcerned by my presence only ~2m away.